Firm-level decisions are largely made by corporate executives whose preferences and attitudes can be shaped by historical traits and what is happening inside their households. We investigate how the involvement of a founder’s wife through marital ownership influences the family firm’s level of risk-taking and explore the underlying mechanisms. Firms and households are treated separately in the general equilibrium framework of classical economic theory. However, a burgeoning body of recent studies shows the importance of the family environment on an individual’s behavior and argues that factors such as having a daughter (Cronqvist and Yu, 2017) or being married (Roussanov and Savor, 2014) can shape the preferences and attitudes of corporate executives. In a recent paper, we examine how intra-household financial decisions are ultimately reflected in the design of corporate policies. Specifically, we focus on publicly listed family firms in China and ask whether firms co-owned by a husband and wife (i.e., marital ownership) are associated with a lower level of risk compared to similar ones solely owned by the husband, and we examine some reasons why. Is the Wife a Risk Mitigator? There are different views regarding how marital ownership can hinder the firm from taking risk. First, the conventional agency theorist argues from the perspective of entrenchment (Bertrand and Schoar, 2006). That is, the family may put wife into the management in order to retain control of the firm. Due to the limited ability and assurance of robust job security, these executives may adopt risk-averse strategies and avoid complex firm policies. Second, the family business literature argues that the involvement of wife can facilitate the family’s objective of preserving the firm as a legacy for future generations and thus is more reluctant to take risk (Gomez-Mejia et al., 2007). A third view emphasizes the gender behavioral differences, in particular, the innate gender gap in risk preference. To the extent that the profiles of family businesses would be shaped by such discrepancy, firms co-owned by a husband and wife would exhibit a lower level of risk. We explore this question using a standard sample of Chinese publicly listed family firms that we complement with precise information on the spousal (and other) relationships of the controlling shareholders. Our initial sample consists of all non-financial and non-utility firms listed in the Shanghai and Shenzhen Stock Exchanges. We further limit the sample to family firms based on whether the founding family retains significant equity stakes in the firm. Our final sample consists of 4,231 firm–year observations, representing 774 unique family firms during the nine-year period from 2008 to 2016. Table 1 presents our baseline results. 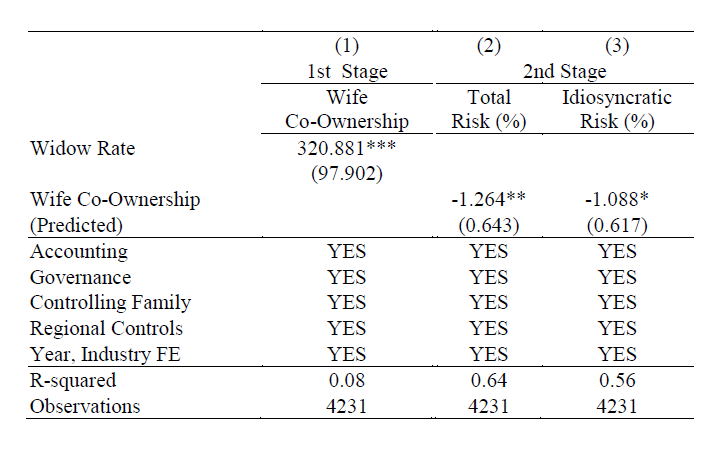 Consistent with the above views, we find that family firms co-owned by the wife have a return volatility that is 2% lower than those solely owned by the husband after controlling for firm, personal, and regional characteristics (Column (8)). The results are also robust based on a matched sample using the observable characteristics of the firms. We further examine other forms of co-ownership as placebo tests, including those co-owned by other family members as well as by other families. In both cases, there is either no statistically significant difference or higher risk taking associated with the co-owned firms. The lower level of corporate risk observable in family firms co-owned by the wife is attributable to the tendency of a married couple to pursue less aggressive investment policies, including fewer merger and acquisition activities and fewer research and development expenditures. Additional analysis reveals evidence of more conservative financial policies, like lower financial leverage. There is obviously endogeneity concern with the regression analysis. The observed gap in risk taking may simply reflect unobserved differences that can influence corporate decisions. To address the endogeneity issue and establish the causal interpretation, we employ an instrumental variable approach that exploits regional variations in gender norms, namely, sociocultural attitudes and gender role norms. The persistence of cultural traits can last for generations, over very long periods, especially in local areas (Acemoglu, Johnson, and Robinson, 2001; Nunn and Wantchekon, 2011). Therefore, we take advantage of an historical ideology rooted in traditional Chinese culture that is against female emancipation: the “cult of chastity,” which discouraged a widow from remarrying and required a woman to remain forever a wife to her husband, even after his death. The advantage of this historical approach is that, while it can shape current local gender norms and thus influence the wife’s decision to co-own the family firm, the variation in widow chastity at least two centuries ago is unlikely to affect contemporary firm outcomes. We manually collect the number of chaste widows during the Ming and Qing dynasties at the prefecture level from the Imperial Collection of Four and use the ratio to the local population as the instrument variable. In Figure 1, we plot the distribution of the widow chastity ratio across provinces. 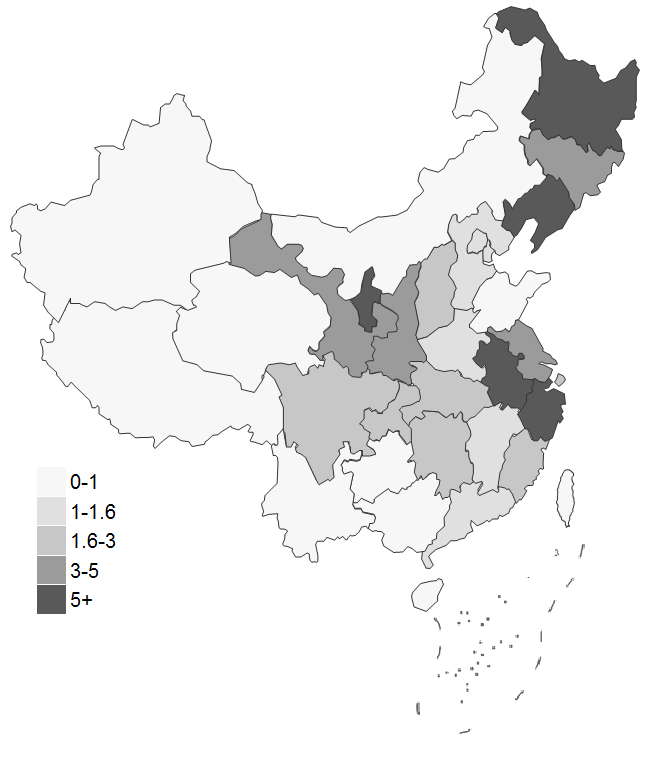 Two historically affluent provinces along the Yangtze River, Zhejiang and Anhui, top all other provinces with the highest ratio of chaste widows. This is largely driven by two of the largest business groups rooted in these regions. In Table 2, we find that the chaste widow rate is a strong predictor of marital ownership: a one standard deviation rise in the widow rate increases the probability of marital ownership by 22.62% relative to the unconditional mean. The second-stage regression also produces an estimate consistent with our main finding. Note: The figure plots the distribution of widow chastity across provinces, where the widow chastity rate is defined as the ratio of the number of chaste widows during the Ming and Qing dynasties to the local historical population, reported in the unit of 1/10000. The wife’s economic power and experience may play a significant role in co-owning the firm and reducing corporate risk taking. We find that family firms take on less risk when the wife has a higher education, is older, and owns more shares of the firm than her husband. These results highlight the wife’s significant role in lowering corporate risk taking. This is a necessary condition for the wife to exert her influence on decision making in the family firm. We verify that, all else being equal, the wife is 39.3% more likely to participate in management of the family firm when the firm is under marital ownership. Evidence suggests that women are typically confronted by an invisible barrier preventing them from moving up the career ladder and China is no exception. We find that, with the wife’s co-ownership, female employees are more likely to be promoted to executive positions. Personal networks of influence and obligations can have significant economic implications, which is particularly important in the Chinese context (Wang, 2013). Therefore, we also focus on the wife’s relatives and investigate whether the appointment of her relatives to executive positions affects the balance of power in the firm. The empirical evidence is consistent with the hypothesis. Children are an important factor in the decision making of family firms. Couples can become more altruistic with the birth of their child. Children, in particular boys, are perceived to ultimately carry the family legacy (Belenzon, Patacconi and Zarutskie, 2016), thus concerns for the welfare of children could induce married owners to behave more conservatively. 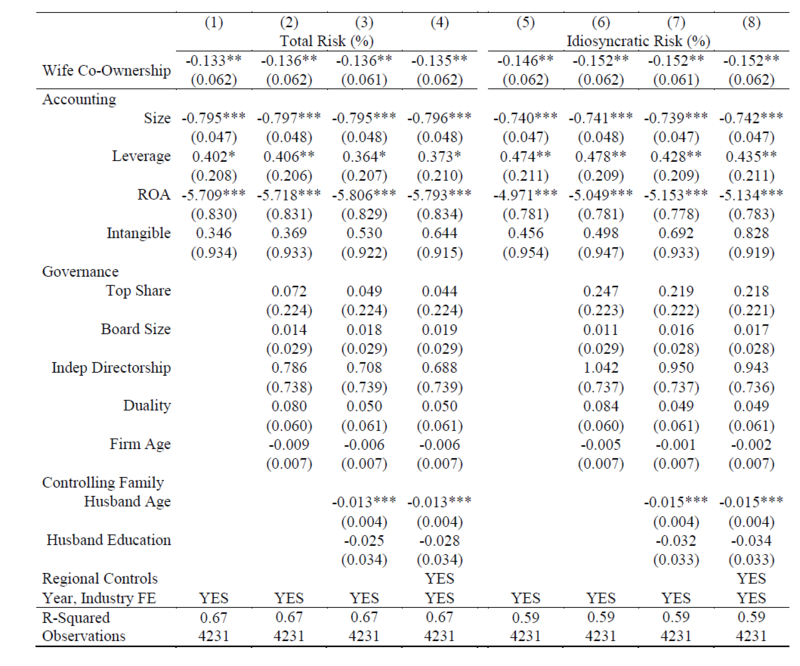 We find that the risk level is even lower for co-owned family firms where couples have a child. In this article, we examine whether marital ownership can significantly shape the managerial preferences for bearing risk and corporate policy choices. We find that family firms co-owned by the wife are associated with lower levels of both total and idiosyncratic risk than otherwise comparable family firms. Our results have normative implications regarding the interdependence of and boundary between households and organizations, as well as the role of gender.